I explained how you can get Google Webfonts on your computer so you can use them in your images. Use the same fonts on your images to make them fit in with the rest of your site. But where you do get the photos to actually add your text to? Whether you’re making a small sidebar image, a featured image for a blog post or your website header, using low quality photos can ruin any image. Here are 15 sites to get beautiful free photos for your blog posts, to use around your site or for great Pinterest images. You probably don’t have the funds to buy great photos for every single blog post, or to build a sizeable image library. But you also definitely don’t have the funds to take the risk of being sued for using copyrighted photos. Don’t get your photos from Google Image Search. These sites offer memberships or pay-per-photo, but some also offer free photos when you sign up for their e-mail list! 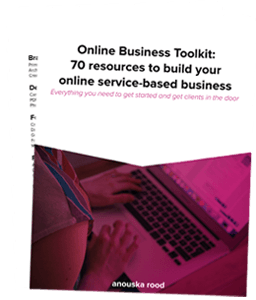 Sign up below to get your Online Business Toolkit – with 70 resources & tools every online service-based business needs!